II. What are the instruments for pricing carbon? Institutions consider a price on carbon for several reasons, across many contexts. Given this, one of two primary methods for pricing carbon—internal levies and proxy prices—may prove more suitable than the other. Every institution should examine its operations to decide which approach works best. A carbon levy imposes a charge within institutions based on carbon emissions. A number of emission estimation tools can work, from tracking historical emissions to counting round-trip flights. The revenue can be redistributed within the institution, retained by a central authority, or funneled into target investments (see Internal Carbon Pricing Decision Tree for visual representation of this idea). Two of the most common designs with a carbon levy are revenue neutrality and investment in a sustainability fund. All of the revenue is returned to those paying the fees. In this sense, the approach is revenue-neutral at the institutional level: funds collected equal funds returned. But each participating unit (school, department, building, etc.) within the institution recovers a different amount than it paid, based on relative emissions. The less a unit emits, the less it is charged and the lower the total carbon levy across the institution. As long as the amount levied is rooted in current emissions and the amount returned is not, the price incentive holds. 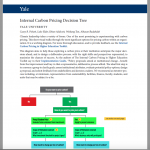 Every month at Yale, for instance, the program charges participating units $40 per metric ton of carbon dioxide equivalent scope 1 and 2 emissions. Units then receive refunds at the end of the fiscal year based on their percent change relative to the university’s overall percent change compared to historical emissions. A revenue-neutral model avoids the political complication of revenue redistribution and can improve buy-in as net loss will not hamstring even the most emissions-intensive departments. Revenue neutrality also avoids the risk of a central authority suffering a budget deficit or surplus as a result of carbon levies. Alternatively, revenue from a carbon levy can be allocated to items thematically related to climate change, such as projects to reduce emissions or engage the community in climate solutions. Arizona State University, as well as several companies, use carbon revenue to purchase carbon offsets or renewable energy certificates. Further variation and hybridity is possible, including a split use of revenue, returning revenue to units with an earmark for emissions reduction work, or spending the revenue in ways that benefit the participating departments. A proxy (or shadow) price does not directly entail money changing hands. Instead, the carbon price is incorporated into cost analyses, as follows: the estimate of any emissions associated with a financial decision is multiplied by a carbon price and this figure is added to the costs. A proxy price can apply at different scales, from campus construction to fleet procurement. It can also complement an internal departmental price by inserting the consideration of carbon into decisions outside departmental jurisdiction, such as campus energy systems. For more on this, see What is a Proxy Price on Carbon? In addition to an internal carbon levy and a proxy price, an internal cap-and-trade program is theoretically possible, but the authors are unaware of any institution that has implemented one. How else can my school advance carbon pricing? Beyond implementing a carbon levy or proxy price, all campus community members, from administrative leaders to students, can host educational events, facilitate civic engagement, and work with local communities on other climate solutions. Institutional leaders can endorse carbon pricing as a strategy, and faculty can integrate carbon pricing into curricula and research. Lays out key decisions in developing an internal carbon pricing approach. 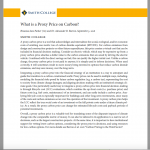 Guide: What is a Proxy Price on Carbon? Covers in more detail the goals, principles, and benefits of proxy carbon pricing in institutional decision-making.